For some ranks in the Guyana Police Force, being promoted during their first five years on the job is almost impossible but things turned out a bit different for one policeman. In a very short time, Constable Derwin Eastman, became a Police Corporal- this is something that doesn’t happen often. He was given an ‘on the spot’ promotion by the Commissioner of Police, Seelall Persaud. Eastman, who became a policeman in 2012, was commended for his exemplary work in the force on Friday last at the Brickdam Police Station annual Christmas luncheon and awards ceremony. Eastman, the ‘A’ Division second best cop, was responsible for the solving of 11 murders in the division, two attempted murders, 55 robbery under arms, 19 robbery with violence,10 narcotics cases and 28 simple larceny cases. He was also responsible for the arrest of 16 wanted persons and he managed to recover three stolen motor cars. This year’s second best cop had a total of 376 arrests. He was the rank responsible for the solving of the October 19 murder of Abdool Saleem Aziz, the 23-year-old Electrical Engineer who was gunned down in front of his Delhi Street, Prashad Nagar home. For that, four men from Sophia are in prison. Eastman walked away with a number of prizes including a 32-inch flat screen television, a bicycle, jewelry and two trips, among other things. He smilingly accepted his tokens on Friday but when the Commissioner announced that he is now a Corporal, the young cop was visibly shaking. In an interview yesterday, Eastman said that he is still overwhelmed. He said that the promotion came at a “nice time” for him and his family. Eastman, who was 2013’s best cop, said that he will be aiming high next year. 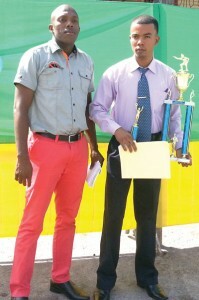 Walking away with the best cop award was Anthony Lowe, a CID rank stationed at the Brickdam Police Station. He was responsible for recovering of eight firearms and the solving of a number of high profile murders within the district. Lowe was one of the ranks, who worked assiduously to solve the brutal slaying of 43-year-old businessman, Ashook Ragghu. Ragghu, of Lot 77 Pike Street, Campbellville, was shot in the chest while his wife, Shyrazadi Ragghu was robbed of $4M. She was also shot to her thigh. For that murder, several persons were placed before the court. Lowe said that he is very happy to be the Division’s best cop for the year. He said that he too will be aiming high.